Learn here Zaragoza, like most other Spanish cities, has certainly seen its fair share of civilizations, conquests. Planning a visit to Zaragoza? Coming here for business? Already living here and want to know more about your city? Look no further. 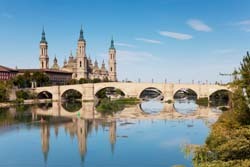 What Zaragoza is your in-depth, up-to-date guide to this special Spanish city. We can guarantee you original and accurate content about one of Spain's best kept secrets. Navigate your way through these easy to use, info-packed sections and discover all there is to know about this genuine Spanish gem. We want to give you all the information for you to decide the best visits and activities in Zaragoza, learn about the city's background -About Zaragoza- and how to move around town -Transportation- amongst many other interesting details.